"Will you follow me... one last time?" The beginning of the end. Warner Bros has debuted the first teaser trailer for Peter Jackson's The Hobbit: The Battle of the Five Armies, the grand finale in his Middle Earth series, and it looks to be a very nostalgic and exciting ending. Martin Freeman returns as Bilbo, Luke Evans as Bard, Richard Armitage as Thorin, Ian McKellen as Gandalf, and everyone else they have in the illustrious cast. As this is the first teaser, it doesn't reveal too much footage, but does hint at how epic the "Battle of the Five Armies" will be and how he's trying to match the tone of Lord of the Rings, so it can lead right into Fellowship. I'm really looking forward to seeing this sure-to-be spectacular Hobbit finale. In a hole in the ground there lived a hobbit... J.R.R. Tolkien's The Hobbit, being directed by Peter Jackson as three separate movies, is set in Middle-Earth 60 years before Tolkien's Lord of the Rings, which Jackson and his filmmaking team brought to the big screen in a trilogy ten years ago. The films, with screenplays by Fran Walsh, Philippa Boyens, Guillermo del Toro and Peter Jackson, were shot consecutively in 48FPS 3D using the latest cameras. 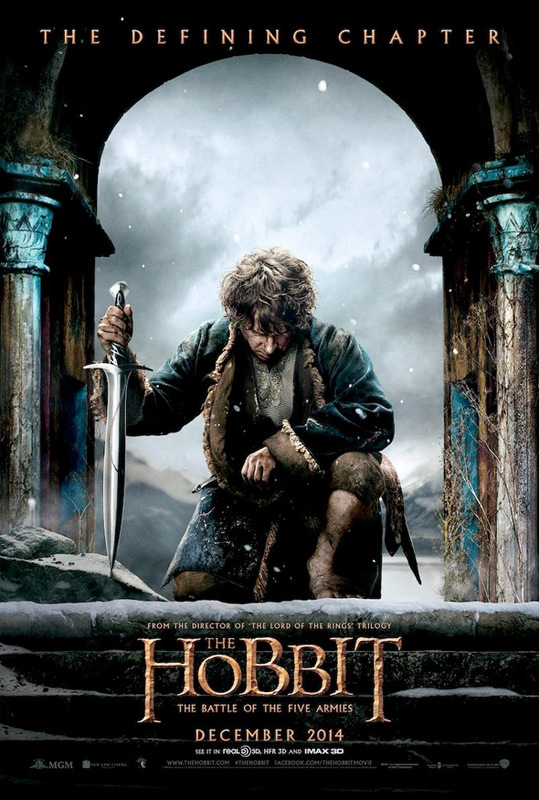 The Hobbit follows the journey of Bilbo Baggins, played by Martin Freeman, who is swept into an epic quest to reclaim the lost Dwarf Kingdom of Erebor. The Battle of the Five Armies arrives in theaters in HFR, IMAX & 3D on December 17th later this year. It all ends in December - see you then. Above is the latest teaser poster featuring Martin Freeman as Bilbo Baggins to go along with this new trailer.